Two BBQ’s in a weekend. Did I mention we love to BBQ? And also I think their is a rule somewhere that you have to have a BBQ on Memorial Day. I stumbled across this recipe from Six Sisters. The hubs said he wanted to grill some burgers, so I wanted to put this one to the test. I know that it is harder for a burger to stay in tact on the grill, so I put down aluminum foil sprayed with some cooking spray to grill the burgers on. Then once they started to get cooked, remove the aluminum foil so that the burgers could get that charbroiled taste. Well the burgers still ended up in pieces. Grrrrr. Once we got the pieces onto the bun, the flavor of the burger was delicious. And the secret sauce is sooooo good. Things I may do differently next time: Add an egg to help hold it together. Will I make it again? Probably not. I thought maybe it was the cheese that made it fall apart. Might have to change the recipe a little if I did. But the secret sauce I will definitely make again. Combine the ground beef, grated cheese, bbq sauce, and seasonings. Shape patties that are about 1 inch thick. With the 1 pound of ground beef I made 5 large patties. Reduce heat to medium-high and place the burgers on the grill. Allow this side of the patty to cook for about 4-6 minutes, but make sure it doesn’t burn. Then flip the burger over and cook until done. For the sauce: Combine all ingredients and whisk until well mixed. Taste and adjust ingredients to your liking. Assemble the burgers and serve with the special sauce, avocado, lettuce, tomato, cheese, pickles and your other favorite hamburger toppings! I tried this sauce last night, it was so good! We dipped our fries in it too! Thanks for sharing this recipe! To make sure the burgers don’t fall apart try this: make them into a patty and in between burgers put wax paper/parchment paper and put in the frig for 20 minutes or so. Everytime we do this our burgers do not fall apart. It’s the BBQ sauce in the burger that makes it fall apart. I have used it before and you can only put a very small amount otherwise it is way too moist. It gives it a great flavor though! Agree with Michelle…too much BBQ sauce made them fall apart. Reduce it to 2 tablespoons and you should be golden. I like putting 2 tbl of beef broth in my burgers. Makes them nice and moist and very tasty. You can use pretty much a couple of tablespoons of whatever liquid. Mixing up some honey and soy sauce, with some fresh squeezed lemon or lime (to your taste) is nice too. 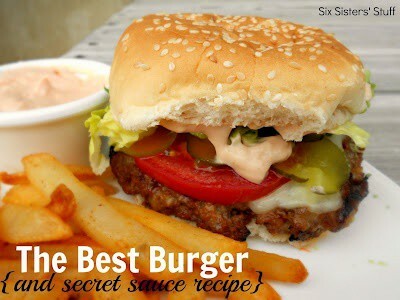 Mix it with your burger and use what’s left to baste the burgers while grilling…YUM! A dry BBQ rub will do better in the burgers. I use strawberrys BBQ rub but any of them will do. A sweet and smokey flavor is the best though I have found. And your burgers will stay together .